Council checks out disc-golf frisbees during meeting. Despite public input strongly favoring preservation of the old McArthur Island golf course property as a passive nature park, Kamloops City council today (Jan. 29, 2019) approved turning it into a combined park and disc golf course. After hearing an enthusiastic presentation from staff in favour of the multi-use option, council voted 5-3 in favour of it. Councillors provided varying reasons but it boiled down to a belief that the two uses, along with other features, could live in harmony. The Kamloops Naturalist Club had strongly opposed including a disc golf course. Coun. Kathy Sinclair said she believed they can exist in the same space, while Coun. Mike O’Reilly worried about it becoming a haven for “marginalized population” without activity. One of Mayor Ken Christian’s concerns was that if the property becomes too attractive to deer they’ll become an urban problem. Affordable recreation was a key reason Coun. Sadie Hunter supported the recommendation. Coun. Bill Sarai urged the naturaliss club to remain involved in the design of the project. Opposed were Councillors Denis Walsh, Dieter Dudy and Argun Singh, with Walsh and Dudy favouring a nine-hole option, and Singh saying it was clear the public wants a passive space. He, too, said nine holes would be better than 18, but urged both sides to get along. “I encourage you not to hate us and not to hate each other,” he said. 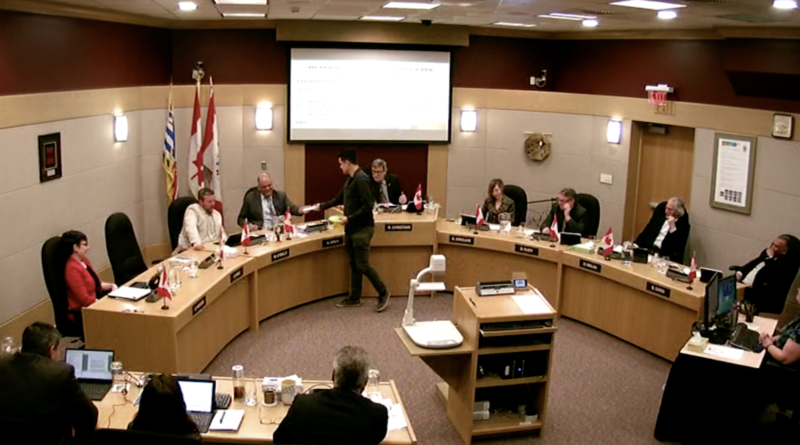 During public inquiries, before council debated the issue, several members of the Kamloops Naturalist Club spoke against including disc golf. The proposal will now be included in the council’s budget discussions. Goes to show how all the election posturing by them “candidates” is of absolutely no value. Although at least one of them seems to be (more or less) consistently on the smart side of each issue. Sacrilege! Totally amoral. When will Kamloops WAKE UP? And what is with the enthusiastic presentation by staff???? As someone else said, should they not be neutral?? Can we have another election so I can have a do over. I encourage you not to hate us and not to hate each other……….that ship has sailed. Please don’t ever ask for public input again, as you do as you want……just do it and stop pretending you give a rats behind about what your constituents want. Oh, and if I get hit by a flying disc at Mac Park, I will sue you. Costing the tax payers a million dollars to turn this beautiful park into a horrible disc golf space, what a tragedy! Aren’t staff supposed to study, then present a neutral report on the situation ? Why have they become cheerleaders for one side or the other on certain projects ? Something is starting to smell at city hall. Is anybody surprised ? They didn’t even consider the Rabbit island inclusion of r either project.Rabbit island is still there and may eventually becvome part of the Mac Is park.